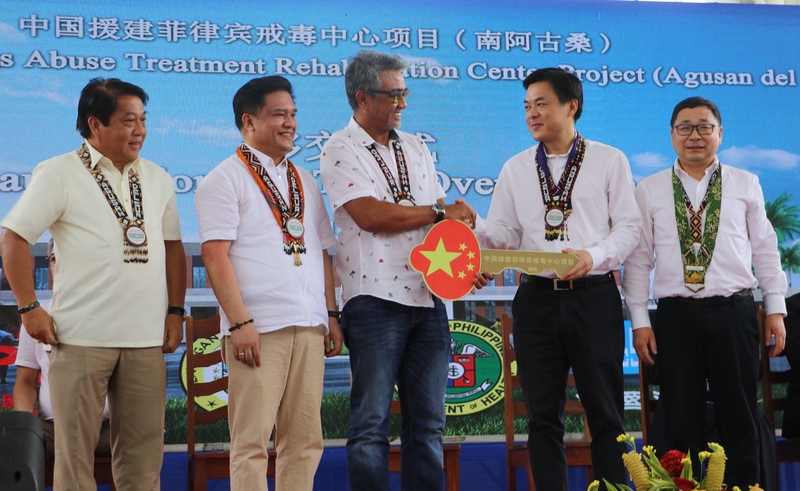 The 6,750-square-meter facility on a three-hectare lot is the second Chinese government-aided drug rehabilitation center in the Philippines to support the Philippine government's anti-drug campaign. "It is a strong demonstration that the Chinese government will accomplish every commitment to help the Philippines, our friendly neighbor," said Jin Yuan, Chinese embassy's Economic and Commercial Counsellor, adding that China firmly supports the Philippine government's effort in improving its people's health. The newly-inaugurated drug rehabilitation center is a 150-bed capacity facility with an administration and clinic building. There is also a multi-purpose covered court, dormitory buildings, and visitors' house in the center. The whole project was undertaken by the China State Construction Engineering Corporation (CSCEC). The drug rehabilitation center project, which broke ground in February 2018, was initially expected to be completed within 21 months. "Thanks to the cooperation between the two countries and the hard-working of Chinese, local workers, the term shortened to nearly 13 months," said Liu Wei, General Manager of CSCEC Philippine branch. Around 10.4 million U.S. dollars (540 million pesos) worth of Philippine materials and equipment have been purchased and used in the drug rehabilitation center project, including construction materials, machinery, furniture and medical equipment, said Liu. "Our construction company also hired more than 400 local workers and administrative staff to ensure that residents around the province benefit from the construction of the project, while the number of Chinese employees is only 35," Liu added. Roger Tong-An, the undersecretary of the Philippine Department of Health, attended the inauguration and turn-over ceremony to unveil the facility along with Chinese officials. "This is the first drug rehab center in Agusan del Sur province. Thank for the support from the Chinese government and we are really happy about this project," Tong-An said. Edward Plaza, the governor of Agusan del Sur province, said this drug rehab center gives the local government a chance to solve the drug problem and to provide better help to the drug dependents in this province and provinces nearby. "We would like to cooperate with our counterparts in DOH to address this issue," he added.